American Girl Doll DM86 no box Pleasant Company Kirsten White Body 1986. 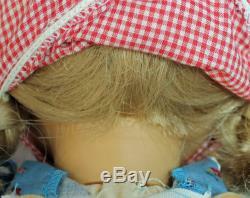 This Kirsten doll is marked "Pleasant Company" on the back of the neck, and has a white cloth body. The strings are long and flat. Her limbs are tight, Eyes Blue and working. She comes in the original Pleasant Company blue calico dress tagged "West Germany", Blue Hair Ribbons, pantaloons (elastic at waist is stretched out), striped socks and brown boots are original to this doll. 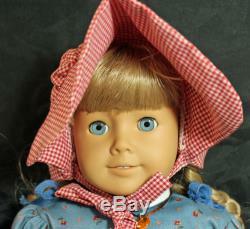 Additional, she comes with her meet Accessories bonnet, spoon bag, spoon, amber heart necklace and kerchief. 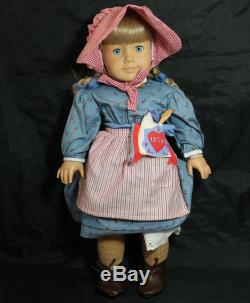 Kirsten Larson is one of the first three Historical Characters of the American Girl Dolls, representing the Pioneer Era. WE NEED YOUR Beanies, Coins, Collectibles & More!! Up to 40 items can be combined on one invoice. Unpaid item cases will automatically be filed after 10 days. US packages are insured and include tracking. Stock photos are used unless otherwise specified. When actual photos are provided, they are part of the description. Tags and boxes may differ from picture. We are "Closed" on weekends and holidays. We try to return messages over the weekends, but it is not always possible. Turn your items into cash for more info. The item "American Girl Doll DM86 no box Pleasant Company Kirsten White Body 1986" is in sale since Monday, February 11, 2019. 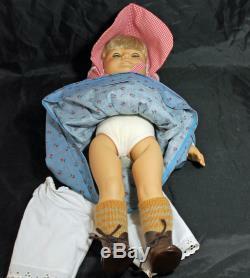 This item is in the category "Dolls & Bears\Dolls\By Brand, Company, Character\American Girl\Kirsten".